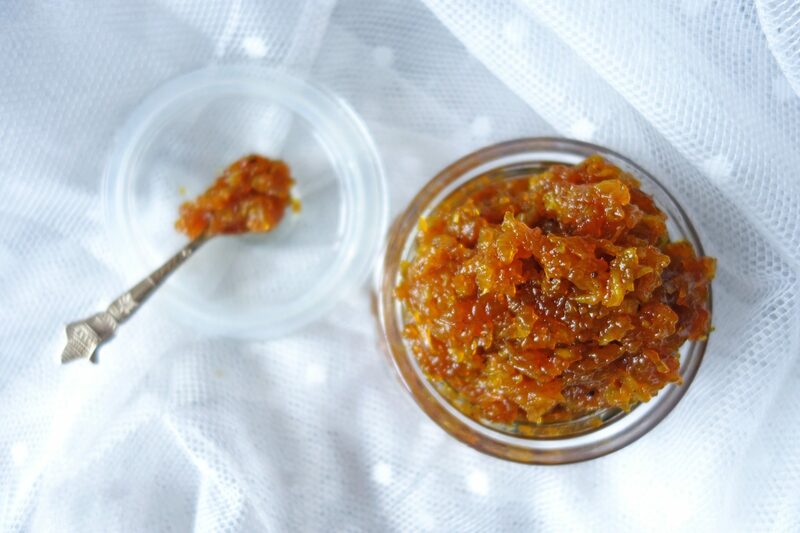 Mango chutney is one of my favourites in summer. 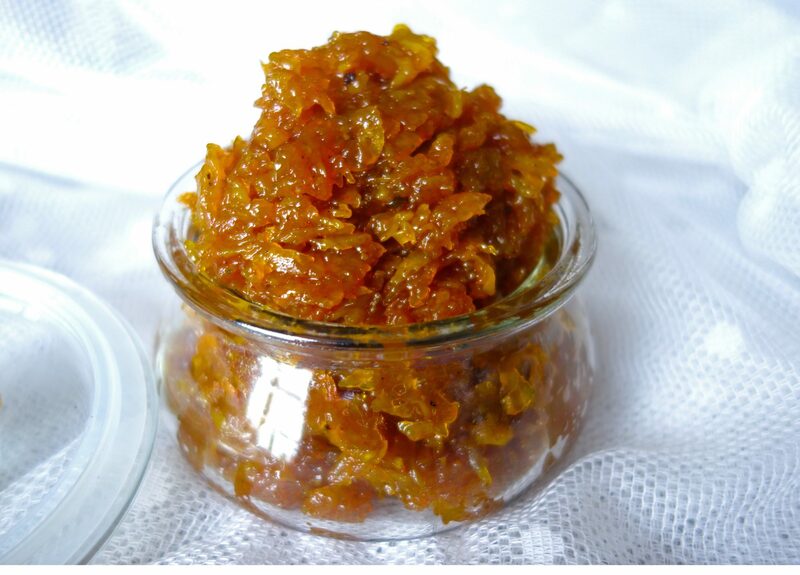 Though I am a chutney lover, and i love having chutneys, dips, pickles as an accompaniment to my meals, this one chutney along with being really flavourful , brings back lots of my childhood memories. 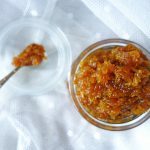 The aroma of raw mangoes, the essence and flavour of this take me back to my mums kitchen in summers , when I was little and watched her grate loads of yummy and tangy raw mangoes , and make this chutney . I loved sneaking in a raw mango or two and relish it, just as is, or with a little salt. 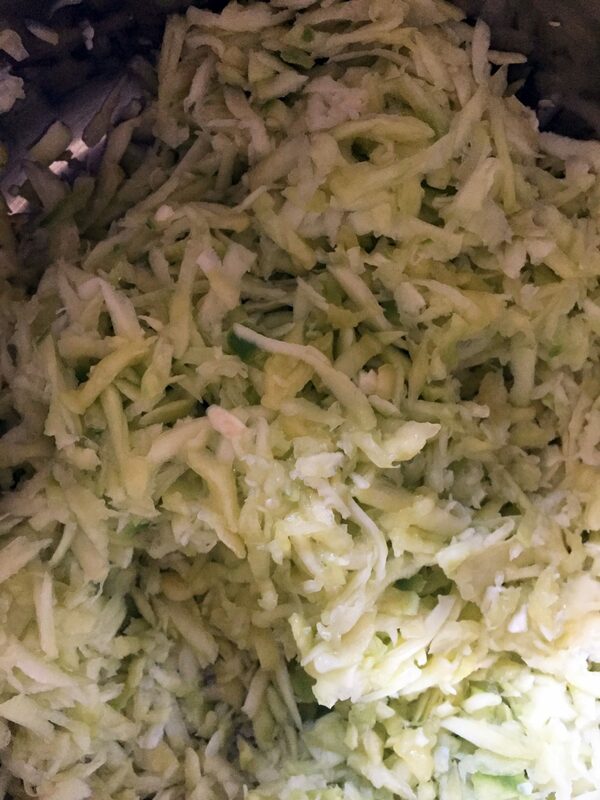 She still makes this every summer, and sends me a bottle or two , as I love this chutney with every meal, and now my husband and my daughter love it as much. For Aahana (my daughter) , this is a mango dip, and she loves eating this with bread sticks, or poppadoms, or even on her toast. I never tried making this, as in India even after my marriage she used to send it to me, and I never made an effort to try this. But now when I realised, I could not get hold of my favourite mango chutney that easily, and I still need it with my meals, I bought some raw mangoes, asked my mum the recipe and gave it a shot.I had to struggle, once or twice to get the perfect texture, that is neither too liquid, nor too sticky and hard, I did manage to perfect the taste of this versatile accompaniment!! 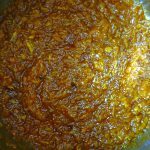 Besides the texture, as I said, it tasted as delicious and fresh as could be.This chutney is a blissful combination of sweet, sour, tangy and spicy. You can have it with your Indian meals, it really enhances the taste of any meal, with rice, paranthas, or even use it as a dip with snacks. 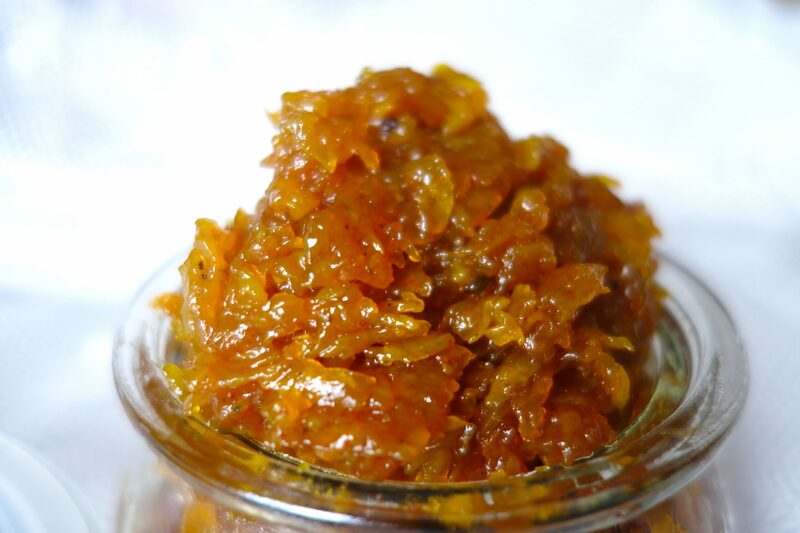 Also you can top your raita’s , or even plain yoghurt with this chutney, and you get an amazing sweet sour mango flavour in every bite.Kids love it on their toasts, mix it in yoghurt for them and they have a mango flavoured yoghurt. This recipe is really very simple, quick and easy to make. Just needs a little concentration and attention , as you need to stand right beside the hob, to take it off heat, when it reaches the right consistency. 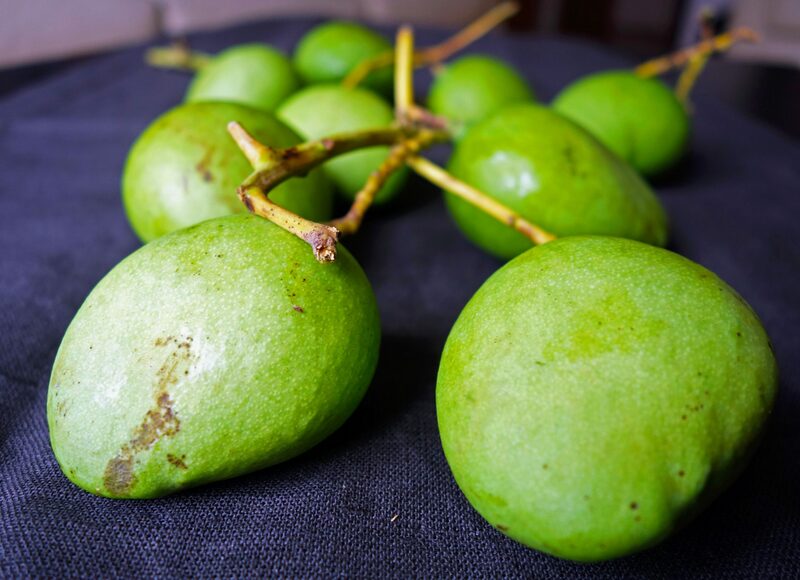 To make this chutney you would need washed, peeled, grated raw green mangoes and sugar. 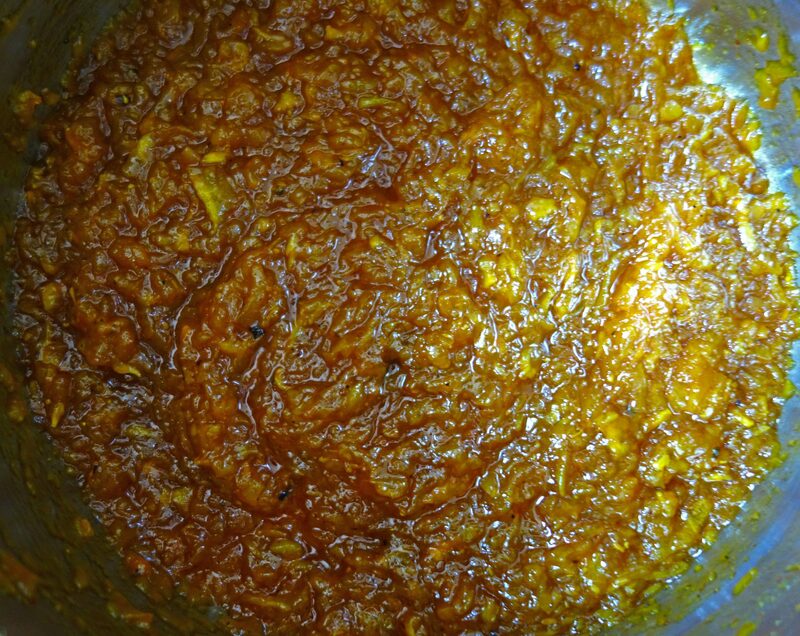 Perfect requirement would be hard raw mangoes, however it would do even if the mangoes have just started to ripen, as this chutney has to be a little sweet. I used unrefined cane sugar, as it is better than the refined sugar we use.You can use the regular sugar as well. 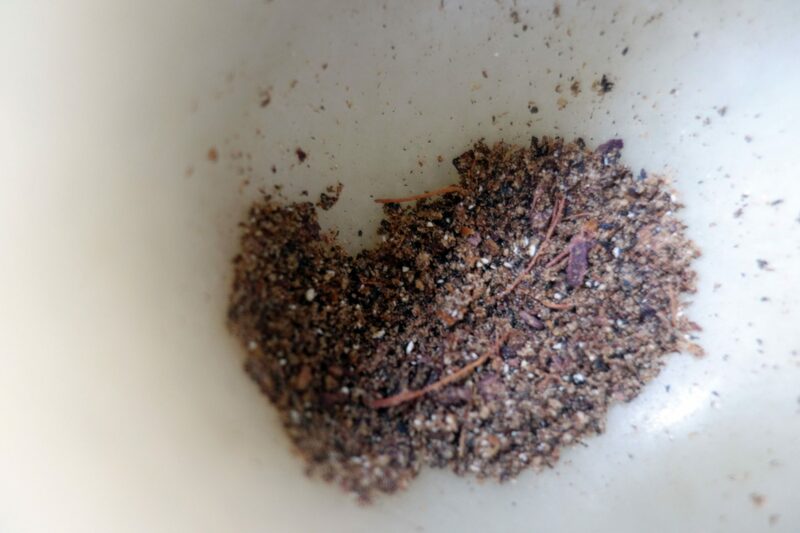 Also you would need some dry spices -powdered fennel seeds(you can use whole seeds or slightly crushed instead of powdered), salt, red chilli powder(degi mirchi powder or paprika can be used), turmeric powder, black cardamom, cloves, whole black peppers cinnamon stick, hing (asofaetida powder ). My mums tip- roast hing powder in a pan for a few second before adding it to the chutney, as it really enhances the flavour of hing powder. 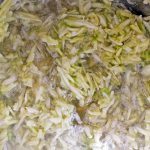 In a big , heavy bottomed pan, add the peeled and grated raw mangoes, add sugar, put it on low heat and let it come to a boil. 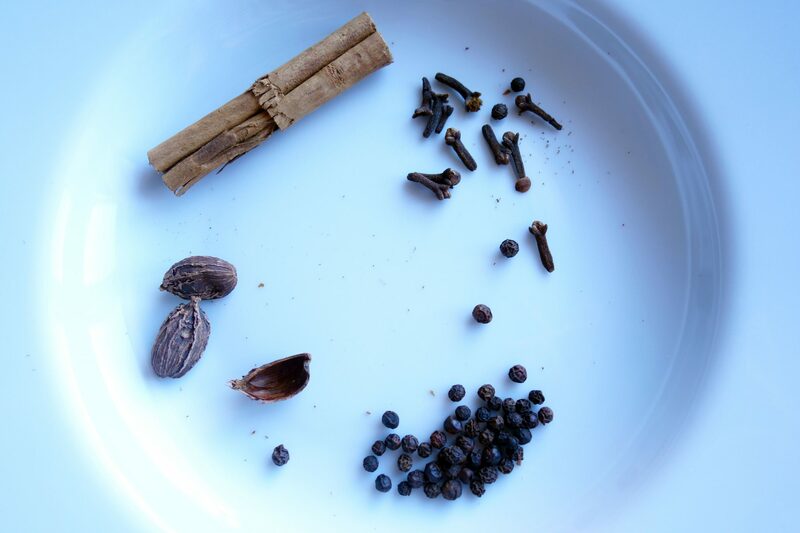 In the meantime, take all the whole spices(black cardamom, cloves, whole black pepper NOT the cinnamon stick- this has to be used as whole), and whizz these in a mixer to make a rough crushed powder (you can even grind it fine if you want). Keep stirring, add the turmeric powder and cinnamon stick and let the chutney boil till it reaches a ‘one string consistency’- To check this, take a little chutney syrup in a spoon /ladle, and when cool, take it in between your thumb and index finger.One-thread consistency is when a single thread is formed (and does not break) when your forefinger and your thumb are pulled apart gently. Once done, add the roasted hing powder (asafoetida), fennel powder, the whole dry spices powder, a little salt, and degi mirchi powder (or a little paprika). Mix well. Add it in clean and dry glass containers, and let it cool. 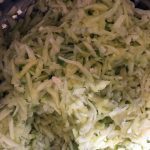 You can make a big batch in summers and store it in fridge, or even outside if it is not too hot and humid. It will last for a very long time, even a year or more. 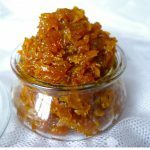 A delectable dip/ chutney made with raw tangy mangoes, and mixed with Indian spices, to give it a beautiful sweet tangy flavour. 800 gms sugar raw unrefined cane sugar, or regular sugar. You can adjust the qty as per the sweetness you want. increase or decrease the qty as per your taste. 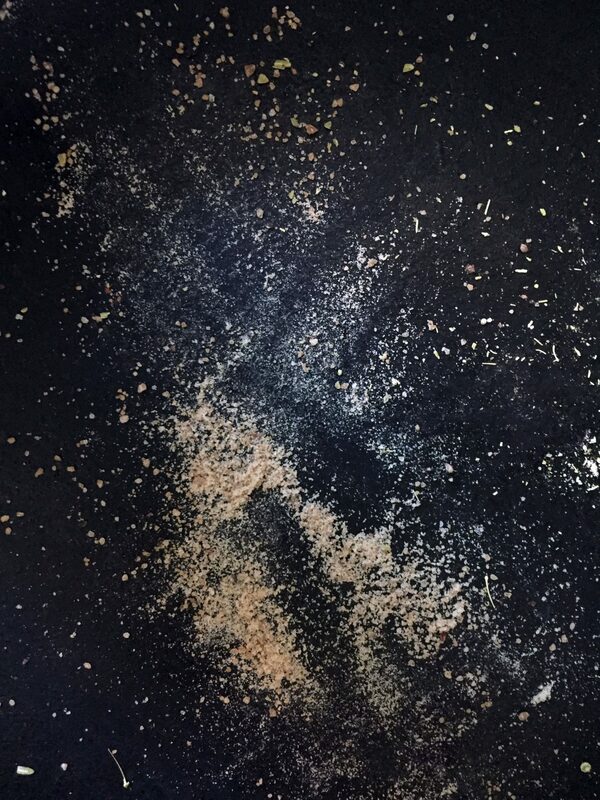 Ground together all the whole spices- black cardamoms, cloves and black peppers into a Fine powder and keep aside. In a big , heavy bottomed pan, add the washed, peeled and grated raw mangoes. Add sugar, and let it heat, and come to a boil. Keep stirring, add the turmeric powder and whole cinnamon stick and let the chutney boil till it reaches a 'one string consistency'- To check this, take a little chutney syrup in a spoon /ladle, and when cool, take it in between your thumb and index finger.One-thread consistency is when a single thread is formed (and does not break) when your forefinger and your thumb are pulled apart gently. Once done, add the roasted hing powder (asafoetida), fennel powder, the whole dry spices powder, salt, and degi mirchi powder (or a little paprika). Mix well. Pour it in clean and dry airtight glass containers.Let it cool. 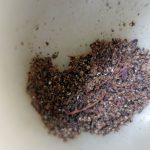 You can make a big batch in summers and store it in a number of containers.Keep it in fridge, or even outside if it is not too hot and humid. It will last for a very long time, even a year or more. 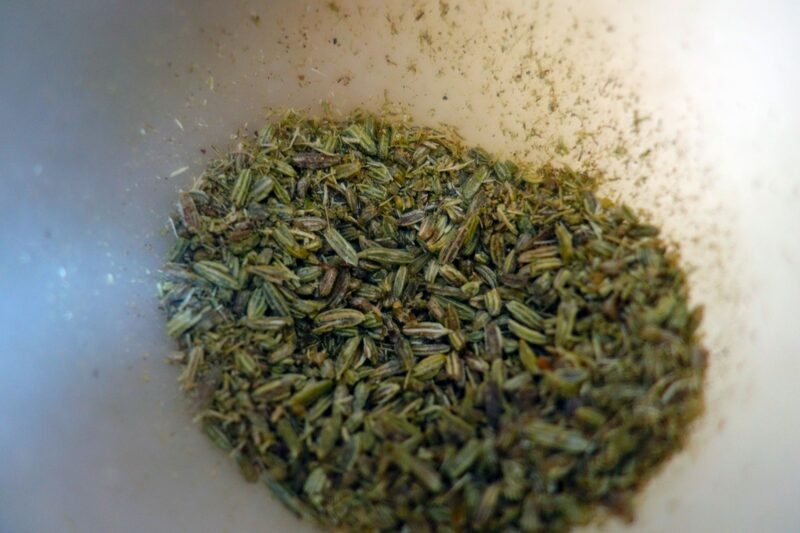 You can use whole fennel seeds if you want. 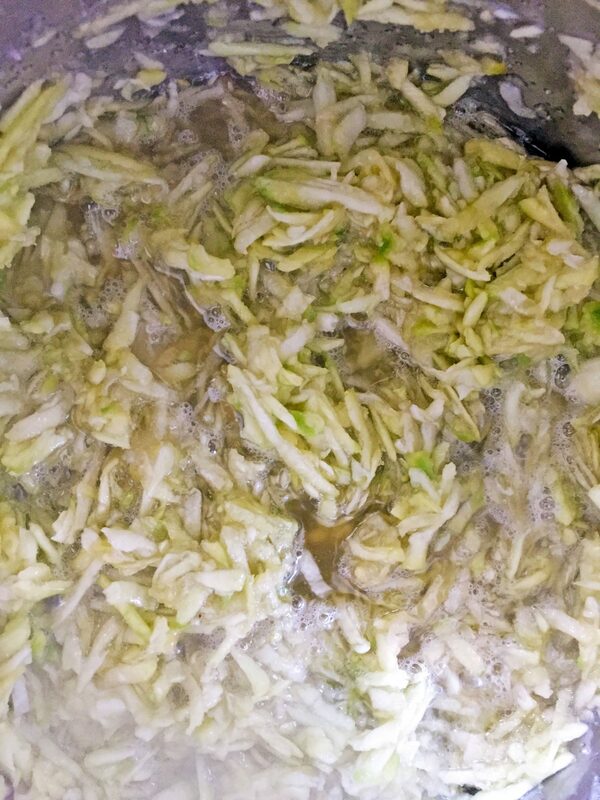 I do not like the whole fennel seeds, so I used the fennel seed powder, as it gives a nice flavour to the chutney. 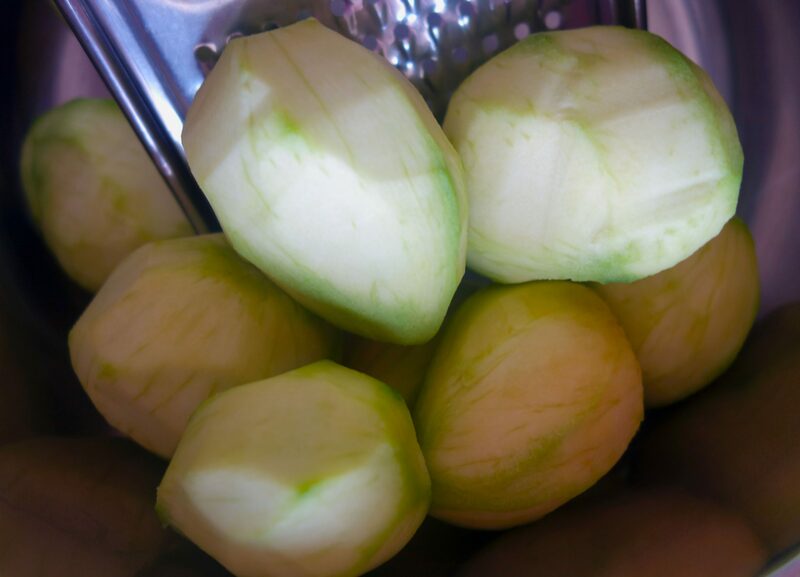 TIP-You can use the hing (asafoetida powder ), as but roasting hing powder in a pan for a few second before adding it to the chutney, as it really enhances the flavour of hing powder. One string consistency'- To check this, take a little chutney syrup in a spoon /ladle, and when cool, take it in between your thumb and index finger.One-thread consistency is when a single thread is formed (and does not break) when your forefinger and your thumb are pulled apart gently.